The Ebac Orion Dehumidifier is a medium to high capacity dehumidifier designed to meet the needs of restoration specialists working in extreme conditions. Engineered with high quality components for effective dehumidification in cold environments the Orion is also tough enough on the outside to withstand the extreme conditions and occasional rough handling that are sometimes inescapable in the demanding conditions of restoration work. For a unit of its power the Ebac Orion is a relatively compact machine and measures just 22 x 24 x 44 inches. This is of considerable advantage on some restoration sites where access can be limited and floor space restricted. It is also helpful when it comes to moving the dehumidifier to a new location as it should fit easily into most transport vehicles. The Orion is a heavy machine and weighs 165lb. A unit of this weight will clearly require mechanical force to load and unload from a vehicle but once on a level surface it can be manoeuvred with relative ease as it is fitted with two rugged wheels and has a sturdy handle to control movement. 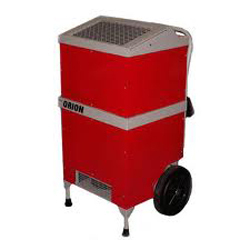 The Orion is a powerful machine and can extract moisture from the air at a rate of 105 pints per day at the Association of Home Appliance Manufacturers (AHAM) standard conditions of 80°F and 60% relative humidity. It is in the nature of restoration work that conditions are frequently more severe than this and at saturation this unit will remove a huge 28 gallons or more. The water extraction power of this unit allows it to deal effectively with areas of up to 1800 sq ft (manufacturer's recommendation). The Orion is equipped with a high efficiency rotary compressor and a high static backward incline fan for maximum performance. The working parts are mounted on a sturdy steel chassis and enclosed in a strong steel casing, coated with an epoxy powder coating for extreme durability. Low temperatures are no problem for the Ebac Orion dehumidifier as it incorporates Ebac's effective reverse cycle defrosting feature which automatically melts away the frost that builds up on the refrigeration coils at lower temperatures. This feature allows the Orion to function efficiently at temperatures down to 33°F. This unit can be effectively operated by one person, with attendant cost savings. It can also run unattended if required as it has a continuous drainage capability built in. This can operate by means of a gravity feed to a nearby drain at floor level but if this is not convenient the condensate can be discharged up to 100 feet away at the same level or to an outlet up to 20 feet vertically above the unit. This is possible because the Ebac Orion incorporates a powerful condensate pump, a further extension of its capabilities. The condensate pump has a purge feature to enable all water to be evacuated prior to movement to eliminate the risk of spillage in transit. For the convenience of commercial owners the Orion is also fitted with an hour meter and for the comfort of all those in close proximity to the unit it is exceptionally quiet for a dehumidifier of its capacity with a maximum noise output of just 57dB. To complete the package the Orion is an economical and efficient unit to operate, with an amp draw of only 3.5 when running, and an automatic humidistat. While designed for the particular and demanding requirements of the restoration specialist this unit has other applications in commercial or industrial settings, or even in the domestic market, where extreme conditions are present and a less capable unit is not up to the job.